Post # 118 Ace is the Place . . .
Back about a hundred years ago, there was a commercial for Ace Hardware where a catchy tune was sung “Ace is the place with your helpful hardware man!” Of course, now it’s changed to “helpful hardware people”, but that’s a different story. Here in town, we have a bunch of Ace hardware stores. It seems like there’s one on every corner, but that’s not really accurate, because every corner has a 7-Eleven. I like hardware stores, especially the “old timey” ones. I love going into stores with crowded shelves and spending a couple of hours rooting through the things that are crammed in the back and covered with two years worth of dust. You never know what kind of treasure you’re going find. It’s like going through a used book store and finding gold. Anyone who has read this blog with any kind of regularity (both of you) will recall my travails with making donuts. Still haven’t found “the recipe” and I was stymied by the cutting process. Watching Alton Brown on the Food Network, I “learned” about a kit of cutting rings running from 3.5 inches down to 7/8 of an inch. True to AB’s philosophy, these are multi-use and watching the show about donuts, you can use the smallest ring and the third largest ring to cut the “perfect sized” donut. I searched diligently in the old style hardware stores, in bakery stores, in restaurant supply stores, and finally found a set in a kitchen store. I was happy happy happy, but still looking for that elusive donut cutter. The donut cutter I was looking for cut out the outer ring and inner ring simultaneously. It was one unit and easy to use. I’d never seen one personally, but had seen pictures on the internet and on television. Every bakery section, every kitchen section, every cooking section of every story I ever went into got searched thoroughly. It didn’t matter if I’d been to the store just a few days previously, I looked just in case it showed up out of the blue in a stock change. No donut cutter. I saw several pan to bake donuts, but I wanted the donut cutter so I could fry donuts. The donuts I’m after are the round version of fried crullers. Mostly, I need the flavor that I remember from my childhood. There’s another small device that I’ve been after for a number of years. Way back in the misty yesteryears of my youth, my mom had a Fry Daddy. It was an electric heating pot you filled with oil to turn into a miniature deep fryer. Once you were finished with it, you let the oil cool, snapped on a protective plastic lid, and put it in the fridge until you needed it again. It helped keep the oil from turning rancid so it could be reused. It was really only practical for families who did a lot of frying. We used it mainly for French fries. Until we stopped using it altogether. It was awkward, hard to store, and took a long time to heat up. But it had one thing that I used over and over for years. The scoop that came with it was amazing. It was slotted so oil drained off quickly. It was long handled to reach to the bottom of the pot without burning your hand, but not so long as to be awkward. It was shaped vaguely like a butterfly so it was easy to flip things into its center. Without realizing they were doing it, they created a very elegant tool for handling cooking food. I kept that thing for years, until I lost it recently. By recently, I mean a few years ago. In the multitude of moves since my divorce, it got misplaced. I’ve seen it once or twice, but have managed to misplace it each time. I’ve looked in all the same places that I looked for a donut cutter. It just wasn’t to be found. I even figured I’d buy the deep fryer again, but when I looked, they weren’t including that same design of scoop. I bought other skimmers that do a good job, but they weren’t the same and in the back of my mind I regretted having lost it. Have you ever seen a pair of wooden toast tongs? These are small, wooden devices that you use to grasp things gently. They are mainly used to get hot items out of toasters. They are made of wood because it doesn’t conduct electricity and are safer to use in a toaster that’s still plugged in. They also don’t conduct heat so grasping them for a length of time won’t burn your fingers. They also don’t last in the dishwasher much past the fifth or sixth washing. Who knew? They’re also impossible to find in any store. So, we have Ace hardware on every corner. I think I said that. There’s one that is so large it takes up a half block. It’s huge! It’s got several door fronts to go to different departments. It’s got a hobby section. IT’S GOT HOUSEWARES! Guess what I found at Ace Hardware? Yup! You see it! 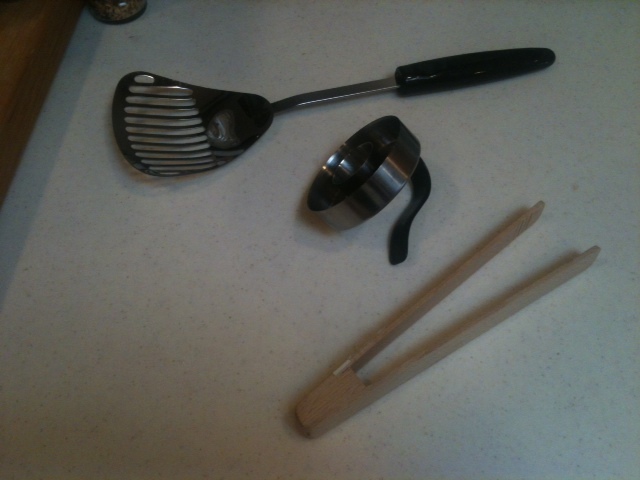 That’s a wooden toast tong on the bottom; that’s a donut cutter in the middle; that’s the Fry Daddy Scoop at the top! Ace really is the place! BTW – Due to some things occurring in my life right now, posts are going to be a little more sporadic than usual. I’ll continue to post at least twice a week, and I’ll shoot for my normal schedule of M-W-F, but with everything happening, I can’t guarantee the days or the times. Thanks for understanding. I haven’t posted a story in quite a while so here’s on for you. Look at the menu to the right and find the link to Happy Birthday To Me. It’s about a birthday I spent in Africa one time. Hope you all enjoy it! Hi! I’m crazy busy today, have been all week. Today will be a very short post, just one to brag. I’ll be posting a short story this weekend, so watch the pages on the right for the new one. You all remember how I planted my garden a few days ago? Well! 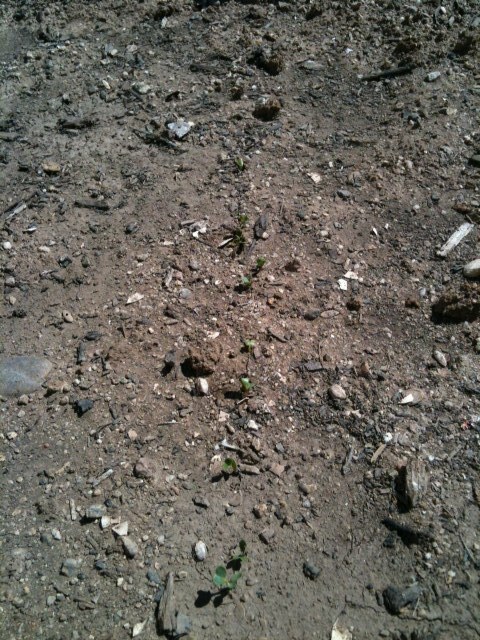 I’ve got radishes coming up already!!! I’m psyched. 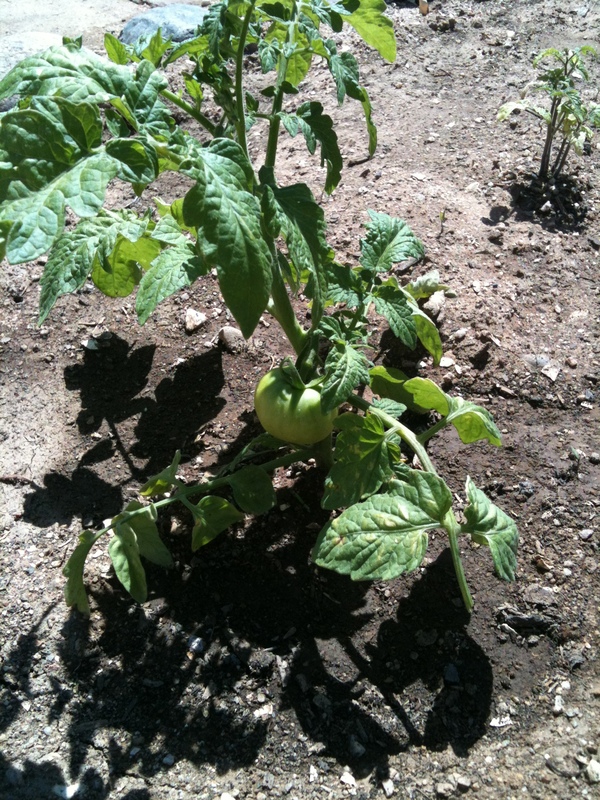 Nothing else is showing yet, but the tomato is looking good, too. So here are a couple of pics. If you look right down the middle of the photo, you will see tiny dots of green. Those are the radish plants just starting to poke their leafy heads above ground. And right dead center on the above photo is the green tomato doing its best to grow large and ripen. 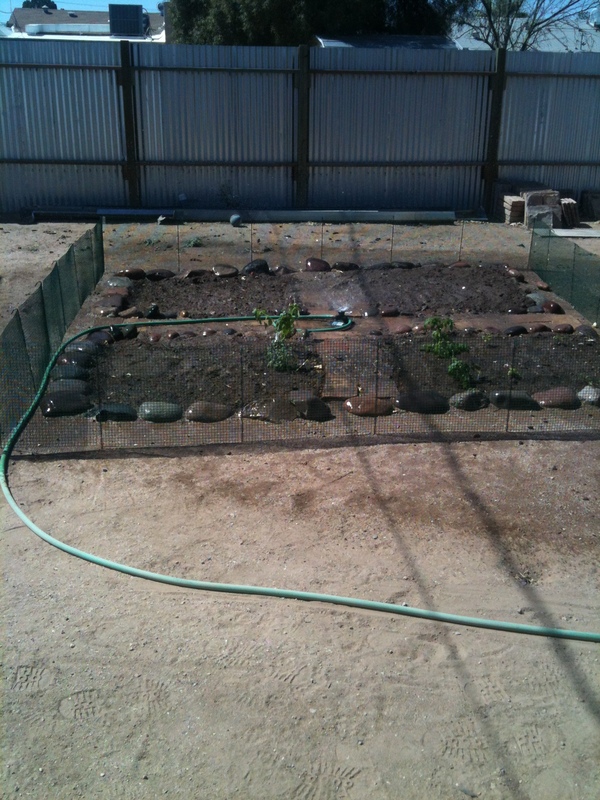 In the background, upper right, is one of the cherry tomato plants I started from seeds. The ground looks a little sere because I water in the morning about 6 a.m. That ensures that the water goes into the ground rather than evaporating before it can soak in. So, anyway, now I feel like Farmer Joe. All I need to do is buy a pair of overalls and I’m set. I haven’t done a restaurant review for a while so I thought I’d correct that by telling you about two restaurants here that we like and go to all the time. One is locally owned and both have some of the best food we’ve had. The first is called Melt: A Sandwich Joint. They’re only opened for breakfast and lunch, and only Monday thru Saturday. Ordinarily, when a business isn’t open on Sunday, I tend not to patronize them the rest of the week for personal reasons. After I found out why this place wasn’t open on Sunday, I was okay with it. Again, personal reasons. It’s a hole-in-the-wall kind of place, and the times we’ve been there, a/c was non-existent. The high ceilings and fans work hard to keep the place cool, but it does get uncomfortably warm. All that being said, the character of the place and the people also work overtime to make this a unique experience. The food is tremendous, inexpensive, high quality, and lots for your bucks. They have two types of sandwiches: cold ones, and hot ones. All are made fresh and made to order. I’ve had three Philadelphias and had them different ways each time with no trouble. Partner/Spouse has tried three different sandwiches and all three have exceeded expectations. See, that’s what’s key in these kinds of places. What are your expectations when you go in, and how well are they met? This place has a lot going for it. It’s inviting, it’s delicious, it’s affordable. It’s amusing in that it named all it’s sandwiches after cities. It serves portions you can actually eat, rather than build a sandwich only a snake with unhinged jaws can get it’s teeth around. It’s a charmer. The other restaurant is called My Big Fat Greek Restaurant. Yep, it’s a play on that movie title. And what you suppose? It serves Greek food! I love Greek food. Oh, hell, I love most foods. But Greek food is a stand out. I love the Mediterranean influence. Tzitziki sauce is something I could dive into and not come up for air until it was all gone. Gyros (it’s pronounced yeeros, but call it whatever you like) is one of the best sandwiches on the planet, and when you take it apart and make a salad out of it, it gets even better! They have an appetizer where they take a chunk of Greek cheese and heat it on a sizzling platter. They serve it on that platter but once it’s at your table, they pour ouzo over it and set it on fire with shouts of “Opa!” I always feel a little silly with the shouting, but the cheese tastes amazing! They also have flame cooked pizza, various pastas, etc. If there’s one in your town, I recommend you try it. Well, enjoy the rest of the day. I’m off to make cookies. Take care! Is there some food that you find absolutely repulsive? My Partner/Spouse hates fish. I love fish. We don’t eat fish at home. I was on a trip to China once, and one of my coworkers hated Chinese food. Even the smell of it turned her stomach. I love Chinese food. We ate at all the American restaurants in the city, mostly at the hotel. One time, we were leaving for lunch (probably at KFC) and one of the local staff had just heated their lunch. My mouth watered and I wanted some so badly. As we waited for the elevator, she turned to me and said, “That was disgusting!” My mouth dropped open, I was so surprised. But I couldn’t help laughing at the difference of opinions. My own gut-wrenching items are milk (and a few other dairy products), Ranch dressing, and jarred mayonnaise. When I was telling someone this once, they asked, “So is it anything white and fluffy?” I thought about it and said, “No, I like marshmallows, and mashed potatoes.” Although I do have to take them in small amounts and infrequently. Ice cream is another “take it or leave it – usually leave it” kind of thing. My father, and both fathers in law all liked something that makes me want to run from the room screaming. They will eat bread and milk in a bowl or a glass. The current father in law will eat either crackers or cornbread (if I made any) in a glass with milk poured over it. I know this is a country-style thing, but I don’t even want to touch the glass after he’s done. My father would also use buttermilk when we had some. Ewwwww! Let me know what foods make you gag. 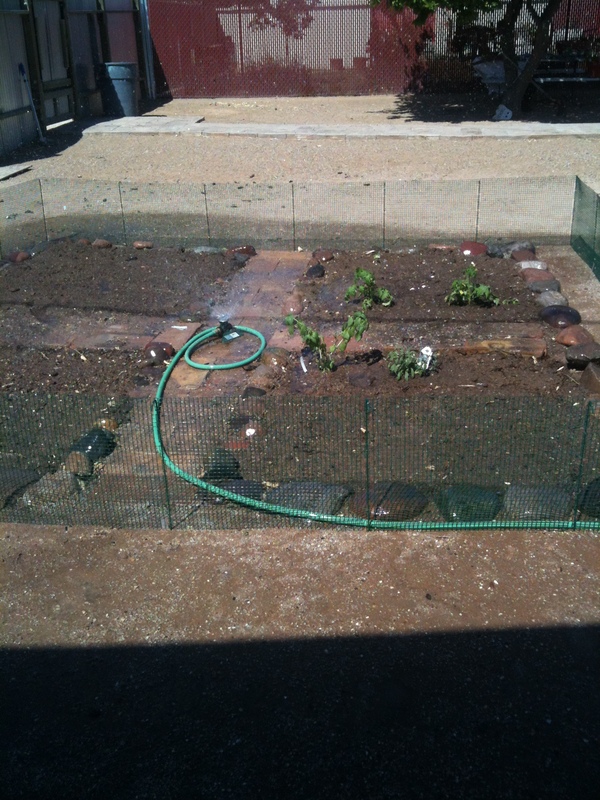 I got the garden in today, and I suppose it’s a good omen that it’s Earth Day today. The garden fence came in last week, and went up around the garden the next day. But one thing or another kept me from actually getting things into the ground, mostly heat. You can see from the pics that the fence isn’t designed to keep anything serious out. It’s mostly there to alert the Boston Terrorist to stay away from the growing plants. He eats them. I’ve seen him do it. In the first pic, you can see four quarters. The first quarter, the lower right one, is filled with tomatoes. The four small plants are the cherry tomatoes I started from seeds. Now they’re in the ground, they should start growing like weeds. The two larger ones are called Goliaths and have a larger, beefsteak style tomato. They were so long in the starter pots, they each have one tomato one them already. In the second quarter, the lower left one, I put in all my herbs. The two larger plants are Sweet Basil and Tricolor Sage. I planted the rest of the garden in seeds. The herbs I planted are two other kinds of basil, and one more sage. I planted curly leaf parsley, cilantro, and oregano. I’ve also got my various mints in pots around the yard, as well as rosemary in pots in the front and hanging along the carport. The upper left quarter has carrots and radishes. These were planted by seed but by a different method. It’s called seed tape. The seeds are affixed to the tape at the correct intervals and all you have to do it put them in the ground. Since I planted early, I’ll be able to get two crops of both of these. I still have plenty of tape left over. The final quarter, the upper right, I put in six green bean seeds, and four purple tomatillos. If I had done all this a month ago, I’d have fresh vegetables already. Oh well. I’ll keep you posted on how it all goes. I put plants in various pots around the yard to get the best effect out of them. We’ve got jasmine, honeysuckle, mint, and bedding flowers all over. With some leftover pots, I’m going to plant sweet pea along the fence so the vines will grow up along the chain link. I’ve tried to start jalapeno peppers from seeds that I dried last year but so far no sprouts. If I don’t see anything by the weekend, I’m going to go to the garden store and get a couple of peppers. Not sure which ones though. Two people who are very near and dear to me are battling cancer right now. I was wondering if anyone out there knew of any cancer fighting foods? Both of them are heavy into healthy eating and I’ve recommended sticking to whole foods and grains with plenty of antioxidants, but does anyone have any specific advice? Thanks! Closing for now. Take care and eat well!